Get to know La Verne in 53 seconds with our community tour uploaded to YouTube in HD. Square Footage: 1,036 sq. ft. - 1,647 sq. 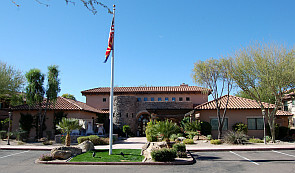 ft.
La Verne is 5 minutes from the JW Marriott Wildfire Golf Club at Desert Ridge. Other courses in close proximity are Tatum Ranch, Grayhawk and Dove Valley Ranch. La Verne is one of our "hidden gems" in North Phoenix. It's located at the end of 40th Street which limits exposure to the general public. North Peak builders did a fantastic job appealing to the wants and needs of those looking to live in a resort-style condo community. There's two heated pools/spas. The main pool has a cascading waterfall, gazebos, lounge chairs and stainless bbq grills. The fitness center is nicely equipped with treadmills, stairclimbers and recumbent bikes. In addition, there's a billiards room, theater room and game room. The community is gated, and most units came standard with large windows, granite countertops, upgraded cabinets, large patios, stainless appliances and a 1 car garage. Guest parking is usually adequate. In contrast to something like Toscana where the homeowners fees are $400.00 a month, the HOA fees of under $200.00 a month at La Verne are a bargain. Be aware that Loop 101 is located to the south of the community. In our experience, the only units that are subject to traffic noise are the ones on the far south side of the complex. If you decide to purchase one these condos make sure to adjust your offer accordingly. Due to the overall size of the community, you can usually find five or six La Verne condos for sale on the market at any given time.